Beer & coffee, the two best options to warm you up when the temperature drops. Coffee IN Beer, even better! 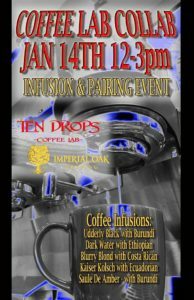 Join us next Saturday, Jan 14th, as we team up with Ten Drops Coffee Lab to bring you a beer and coffee pairing event that is sure to melt your winter blues. 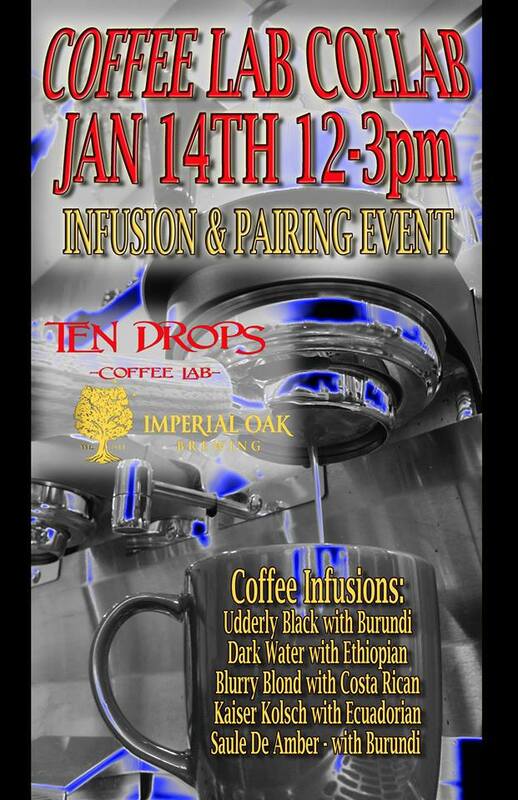 From 12p-3pm we will have the crew from Ten Drops in our pub brewing and serving their java for all. Come try their latest roasted offering side by side with our fresh beer infusions using those same beans. We’ll have 5 different coffee beers in all, and even more varieties of coffee to sample! There are no bottles or infusions available to go for this event, so make a plan to get here for the “Coffee Lab Collab” and try them all!